Van Keulen Interieurbouw’s history is a story of continuous growth. It began modestly. 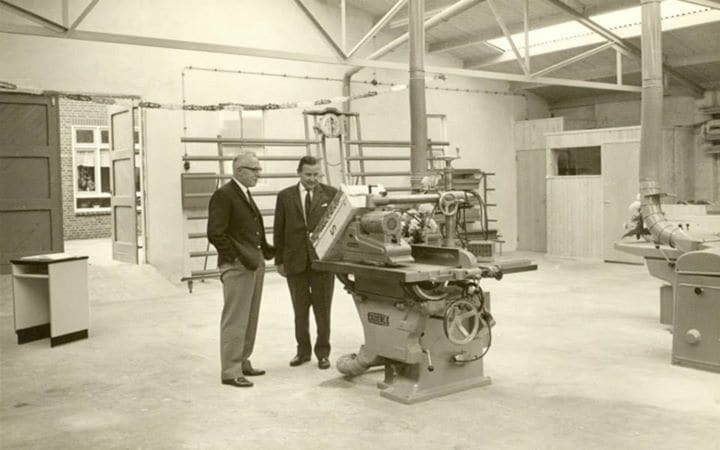 In 1944, carpenter and cabinetmaker Lammert van Keulen started his own company: Van Keulen’s Houtindustrie. Lammert initially manufactured handles for hammers and axes but after buying a shaping machine, he soon started to fabricate playpens. After panelling several shops, in the early 1950s the company was approached by Schuitema, the owner of the Centra supermarkets, to panel a grocery store. The success of this project marked the beginning of a long business relationship with Schuitema. Schuitema opened self-service shops throughout the Netherlands and Van Keulen was responsible for the interiors. The arrival of supermarkets in the 1960s created an extra growth spurt. The activities of Van Keulen continued to expand over the following decade. Besides shop interiors, mobile homes were designed and built by Van Keulen Mobielbouw. Another branch, Van Keulen Kooien, produced extremely robust birdcages. The first acquisition took place in 1980. Van Keulen Interieurbouw acquired the company BEKA Winkelinterieurs and opted for decentralisation so that it could serve all customers operating nationally. After a brief decline and restructuring during the crisis in the early 1980s, Van Keulen Interieurbouw was soon achieving good results again. The second half of the 1980s was a period of great success and explosive growth. The expansion of activities was well reflected in the Van Keulen Interieurbouw factory in Nijverdal, which continued to grow. Besides wood work, the facilities now also included metal fabrication, sheet metal fabrication and metal powder coating. More acquisitions followed in later years: SBM Winkelinrichting in Groningen, Wittenboer Interieurbouw in Helmond, VIDRA Metaalproducten, Stenfert Interieur en Design, and Magista Storage Systems. Thus Van Keulen Interieurbouw was able to also access other market segments, such as library interiors, metal products, storage systems and DIY stores. By now, Van Keulen Interieurbouw has become a leading player in the Dutch and European interior design sector. But we have not forgotten our roots. Van Keulen Interieurbouw is still a family company. A healthy and flexible company where care and concern for customers, employees and suppliers are the solid pillars of the company philosophy. With modern production facilities, high quality products and customised solutions in all shapes and sizes, Van Keulen Interieurbouw is ready for the future! We fulfil your requirements down to the very last detail!